We want to send many thanks to the brothers of Amigos Center for their willingness and compassion which they have shown to us and to all our congregations on the national level. 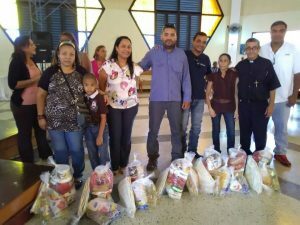 We thank our Almighty God and we also thank you, Pastor Selle, for your goodness and for the work which you have done so that this food could come to us in our congregations in Venezuela. You know that Venezuela is passing through a difficult time; however, our God is faithful and is always with us and has blessed us. 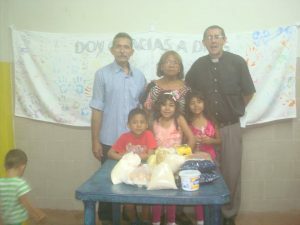 So, once again, thank you so much Amigos Center and Pastor Selle. May God bless you all. 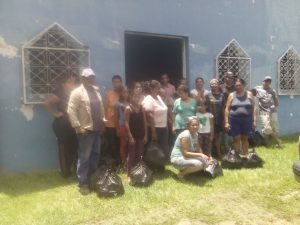 Thank you Amigos Center from Venezuela! 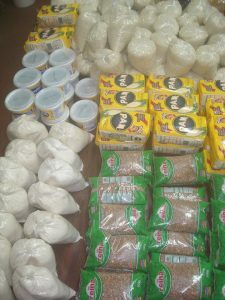 This next weekend we trust that more congregations at the national level we will distributing food also. The most beautiful part is that everyone have seen this as a great blessing and a project where everyone is helping out and we thank God for them. As we discussed at the end, we will be sending a complete report with photos and if you wish we can also send reports to you little by little from those who are distributing step by step… A big hug my brother and many thank and blessings. Blessings and Greetings to my brother Arturo and your wife Dona. We exceeded our goal and raised $10,177!!! Thank you for your continued prayers and support as the situation continues to progress in Venezuela. 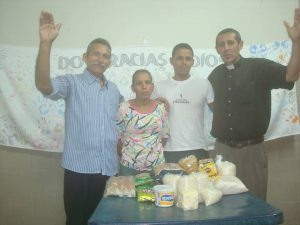 A Project of Amigos en Cristo, Inc. to raise $5,000 to provide food and medicine for the people of Venezuela. To support this project, click the “Donate” button on the right. These are real pictures from Venezuela, taken recently by friends of Global Lutheran Outreach. 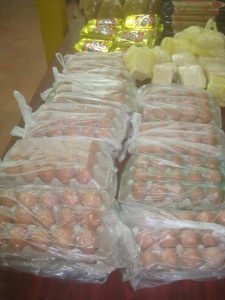 Venezuelans are struggling, and many simply do not have enough to eat. 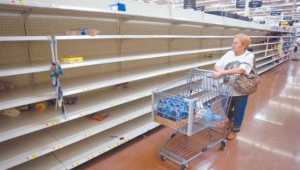 (Left) A woman surveys her options at a Caracas grocery store. (Right) A line of people waiting up to hours to buy two small bags of corn flour. The country of Venezuela is in crisis. With inflation at over 700% in 2016 (and projected to reach 1500% in 2017), people are struggling to get enough food to eat. 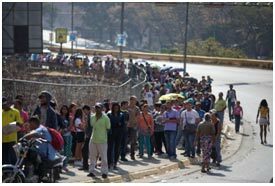 Basic existence in Venezuela is a daily challenge, whether it’s standing in line for hours to get food or medical care, or just walking in the streets and becoming a victim of rampant crime. The minimum wage is about $7 per month. The average worker earns two to four times the minimum wage, or roughly $15 – $30 per month. However, according to figures from the Venezuelan government, it costs nearly $140 per month to feed a family – approximately 20 minimum wages! Many Venezuelans believe that the country is turning into a dictatorship. Recently there have been massive protests throughout the country against the government. People are in desperate need of food. 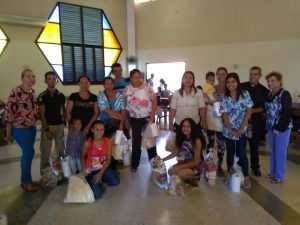 Our Lutheran pastors in Venezuela earn anywhere from $2 – $6 “salaries” per month, or between $14 and $42. The members of the Lutheran congregations are in the same situation. 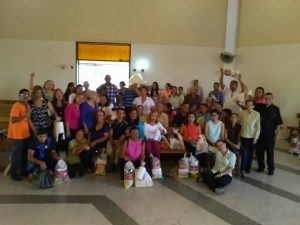 1) Food: To provide supplemental “baskets” of food to Lutheran congregations in Venezuela for distribution to their members and pastors. Each basket of food will cost about $20. 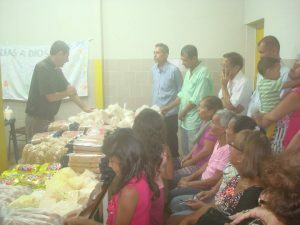 The project will be administered by the Lutheran Church of Venezuela, and locally by each congregation. 2) Medicine: Soaring inflation and widespread shortages make it difficult to purchase medicine. 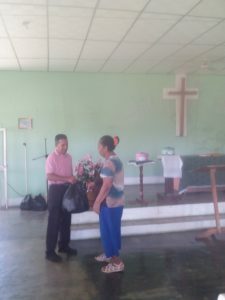 A portion of the money will go to purchase vital medicines for people known by the Lutheran churches to have urgent medical needs. 3) Lutheran pastors and professional church workers. A third objective is to supplement the salaries of Lutheran pastors and professional church workers. This will be administered by the Board of Directors of the Lutheran Church of Venezuela. The Iglesia Luterana de Venezuela (Lutheran Church of Venezuela) was founded in the early 1950’s. Since its inception, Lutheran Hour Ministries has been a valued ministry partner. The ILV has 15 congregations, with about 1,000 members in total, and three Christian day schools. 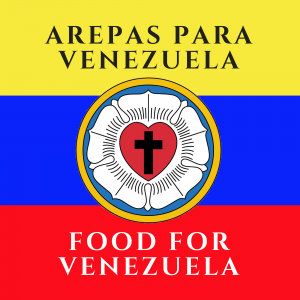 We pray that we can make a difference in the lives of our brothers and sisters in Christ in Venezuela, for as long as the crisis lasts! To support this project, click the “Donate” button below.